Louisiana is a coastal state located along the Gulf of Mexico. Because the state has hot, humid summers and short, mild winters, it can grow a variety of tropical fruits including oranges as well as hearty fruits such as pears. Many fruit tree varieties that thrive in Louisiana adapt well to the range of soil types available in the state. The key to growing fruit trees in Louisiana is to select hybrid trees that are adapted to Louisiana’s climate. Select a location for your fruit trees that is in full sun with well drained soil. Dig a quart of soil from up to 10 locations across your plot of land. Mix this soil and allow it to dry. Place a cup of soil into a sandwich bag and take it to your parish’s extension service. An agent at the extension service will send the soil sample to LSU’s Soil Testing and Plant Analysis Lab for a small fee. The soil testing facility typically returns test results in about three weeks. Prepare the soil by loosening it to a depth of 12 inches with a rototiller. Prepare a wide area of soil so that the fruit tree will develop an extensive root system. Spread a 4-inch layer of soil amendments over the soil based on the test results in step 2. Common soil amendments for fruit trees in Louisiana include peat moss, compost, well-rotted manure and lime to raise the pH of soil. Dig the soil amendments into the soil with a rototiller. Select tree cultivators that are adapted to the USDA hardiness zone that your plot of land is located in. The majority of Louisiana is in zone 8, but the southern coast of Louisiana falls inside of USDA zone 9. If you tree cultivator is self-fruitful, you will only need to purchase one tree. Purchase two trees for cultivators that are not self-fruitful so that the trees will cross-pollinate. Dig a planting hole in the ground that is twice as wide but no deeper than the root ball of the tree. Place the tree’s root ball in the hole and cover with soil. Do not mound up soil or mulch over the root ball’s top or around the trunk of the tree. Cultivate shallowly over the roots to keep grass from becoming established around the tree and competing for nutrients or water from the soil. Prune young fruit trees so that the tree has a central trunk and the limbs are evenly spaced like a ladder's rungs. Tropical trees such as orange rarely need pruning. Fertilize trees in spring based on the individual tree's needs. 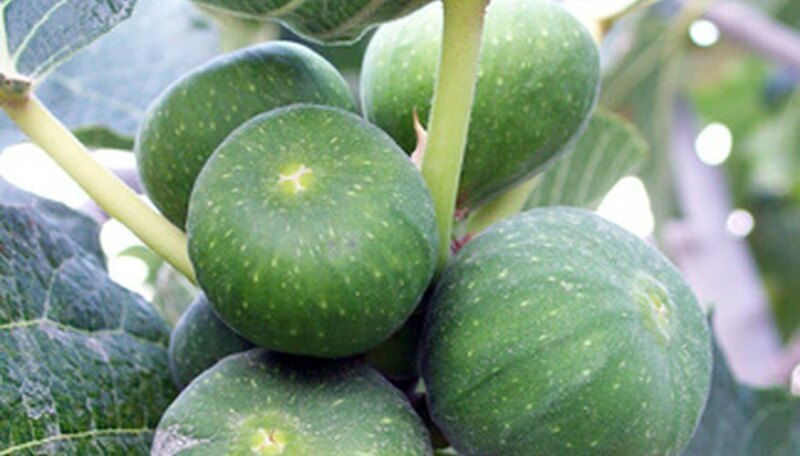 For example, fig trees rarely need fertilizing, while apple trees require a balanced (10-10-10) fertilizer plus ammonium nitrate and stone fruits require a complete fertilizer (13-13-13). Select a granulated fertilizer and apply it according to the package directions. Rates of application vary between fertilizer brands. Thin out fruit once it sets by removing fruit buds so that there is only one piece of fruit per every foot of limb on a tree. Spray fruit trees to help prevent damage caused by diseases and insect pests. Consult with your parish extension service for recommendations for sprays based on pests or diseases unique to your type of fruit tree and your area. Harvest fruit once it ripens to avoid attracting wildlife that often damage a tree in an attempt to reach the fruit. Some tree species will survive in Louisiana's climate, but will not set fruit due to the mild winters. Check with your parish extension service for a list of trees that thrive in your USDA hardiness zone and bear fruit.